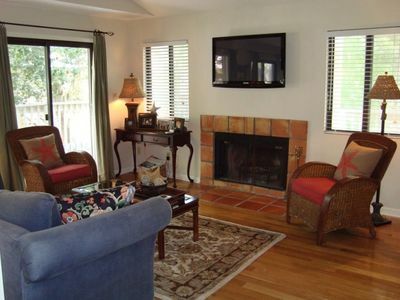 ~ Televisions throughout house, including Blu-ray DVD player in family room. 14 Canvasback is located immediately inside the Ocean Gate. 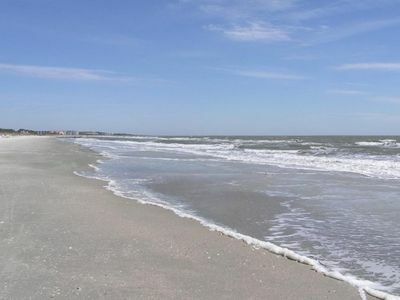 It is situated at the end of a quiet and safe street directly on the beach path. 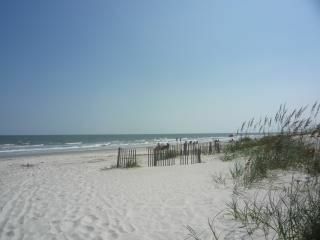 A quick 2 minute walk or a slow 3 minute walk will have you on one of the most beautiful beaches along the east coast. 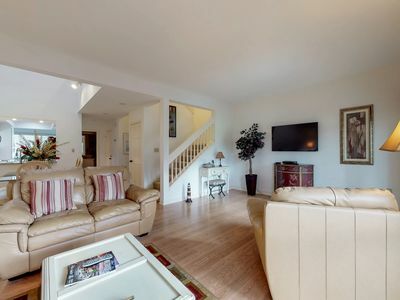 Our home is ideal for two families of four to six or one large family. The split levels allow for great bedroom separation. The first floor has a master bedroom with a queen bed and a bedroom with two twin beds. 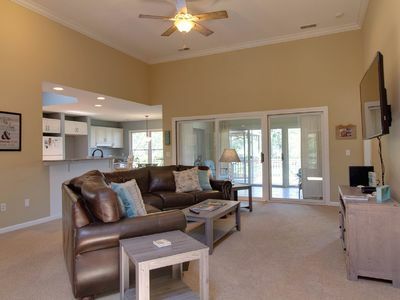 The second level has an open family room, dining area and fully equipped kitchen. 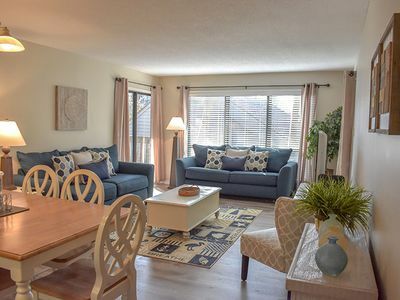 You will enjoy the spectacular windows and natural lighting. Off the kitchen is a washer and dryer. The third floor has a second master bedroom with a king bed and a bedroom with a bunk bed with a twin on top, a full below and a twin trundle bed that can be pulled out. 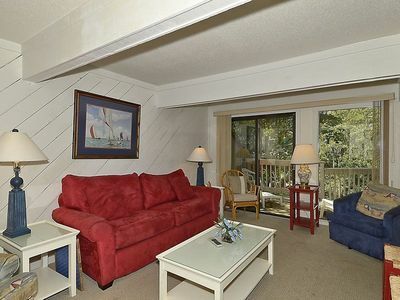 Also located on the third floor is a loft with a sofabed and flat screen t.v./dvd player. 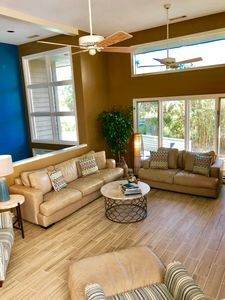 Perfect for the children to watch a movie separate from the second floor family room. 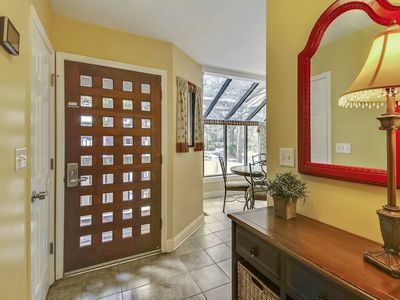 All four bedrooms have their own newly renovated bathroom. Recently updated with new paint, some new furniture and bedding. Both master bedrooms look out to a private pool. 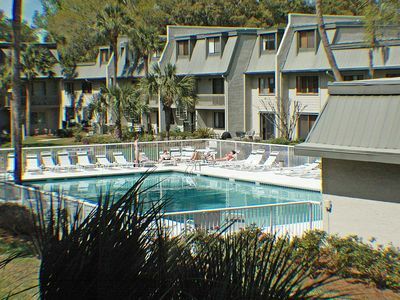 The pool can be heated for an additional charge. 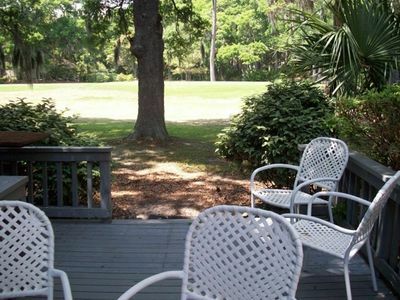 This is a very tranquil area to relax and read a book or entertain by the barbecue grill. 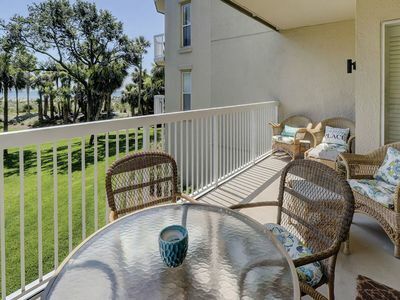 The peaceful serenity of palm, pine and oak trees allows you both sun and shade throughout the day. 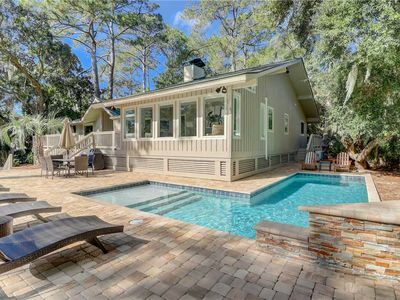 Sea Pines area of Hilton Head is the largest and best known of the Island's vacation destinations occupying over 5000 acres. The amenities are endless on this gorgeous resort, including three public golf courses. - Home of The Heritage PGA tour at the world famous Harbour Town Links Course. You can also find guided horseback rides at the Lawton Stables Equestrian Center into the 506 acre forest preserve. 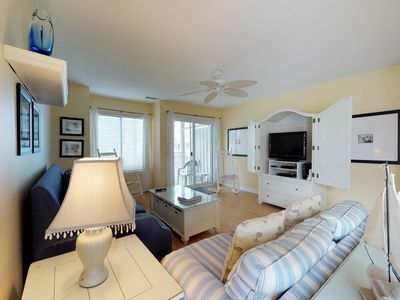 Miles of wooded bike trails, dolphin cruises, kayak rentals, and fantastic shopping and restaurants. 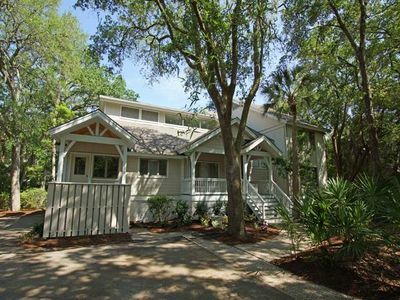 Sea PInes is also the home of The Salty Dog located in the South Beach Marina. 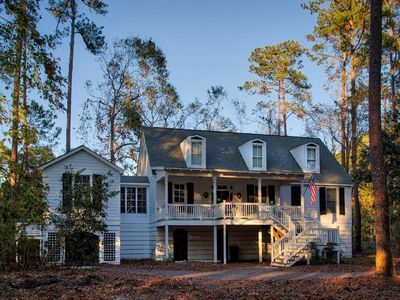 Specially discounted bicycle rentals for this property with drop-off and pick-up to the home address are available through Riding Tigers Bike Rentals. Please ask owner for details. 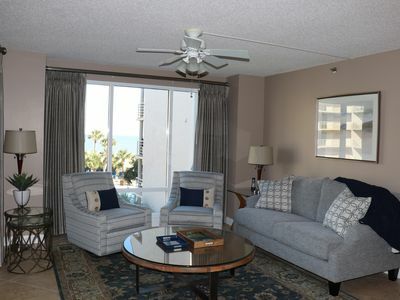 SPECTACULAR VIEWS OF LAGOON AND GOLF COURSE,BEAUTIFUL SUNSETS.BRAND NEW POOL. 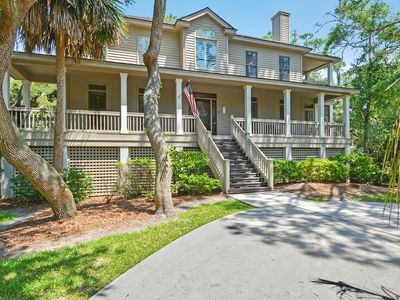 Spacious Sea Pines Home With Beautiful View! Community pool and Tennis! 4 Bikes! 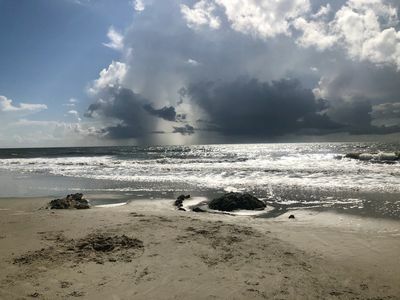 Steps from the beach and Dunes House Restaurant! 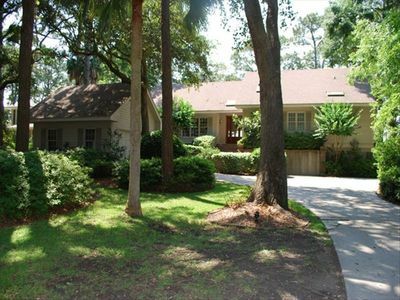 Completely Renovated Dog Friendly Home in Sea Pines with a Private Pool and Close to the Beach! 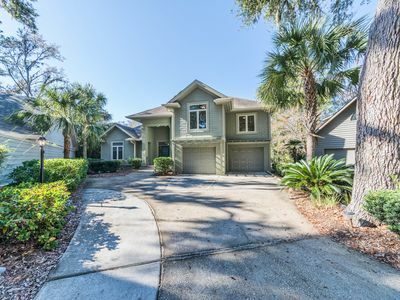 Sunny villa with a shared pool, tennis courts, and view of the golf course!